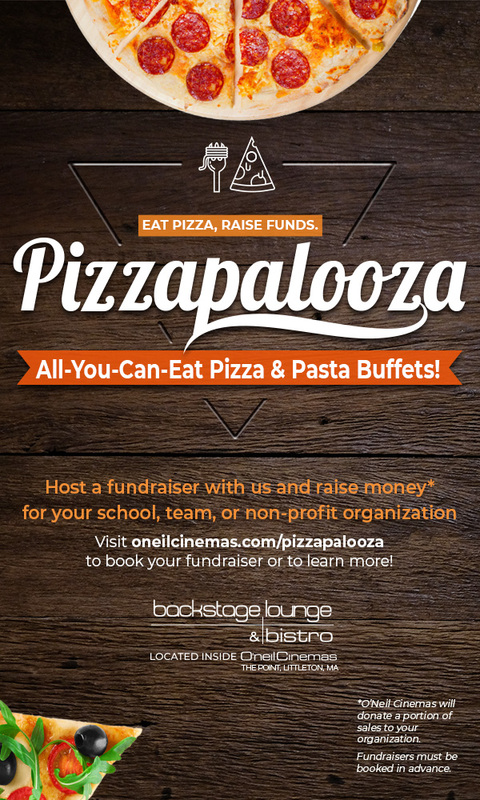 Join us every Wednesday in the Backstage Lounge & Bistro at The Point in Littleton, MA for Pizzapalooza – all-you-can-eat pizza and pasta buffets from 5 p.m. to 9 p.m. Perfect for Hump Day dinner or your organization’s fundraising event – O’Neil Cinemas will donate a portion of sales to nonprofit organizations looking to raise money for a cause. Note: The fundraiser must be booked in advance. *Beverages are also not included in the price of the Pizzapalooza buffet. Seating is on a first-come, first-served basis; buffet offerings are while supplies last. Schedule events early. Although a minimum two-week notice is required to schedule an event, you can schedule your fundraiser up to 3 months in advance. To book a Pizzapalooza fundraising event, fill out this contact form below. Note: Pizzapalooza dates are subject to change and can be discontinued at any time at the discretion of O'Neil Cinemas and Backstage Lounge & Bistro.